Everyone adores the incomparable look of yellow gold, but the designer 6mm traditional fit milgrain 10K yellow gold wedding band at JustMensRings.com is a true thing of beauty. The warm and buttery hue of yellow gold is one that grooms have adored for centuries, but the milgrain detail in this exquisite ring makes it an ideal choice for any contemporary groom with a classic sense of style. 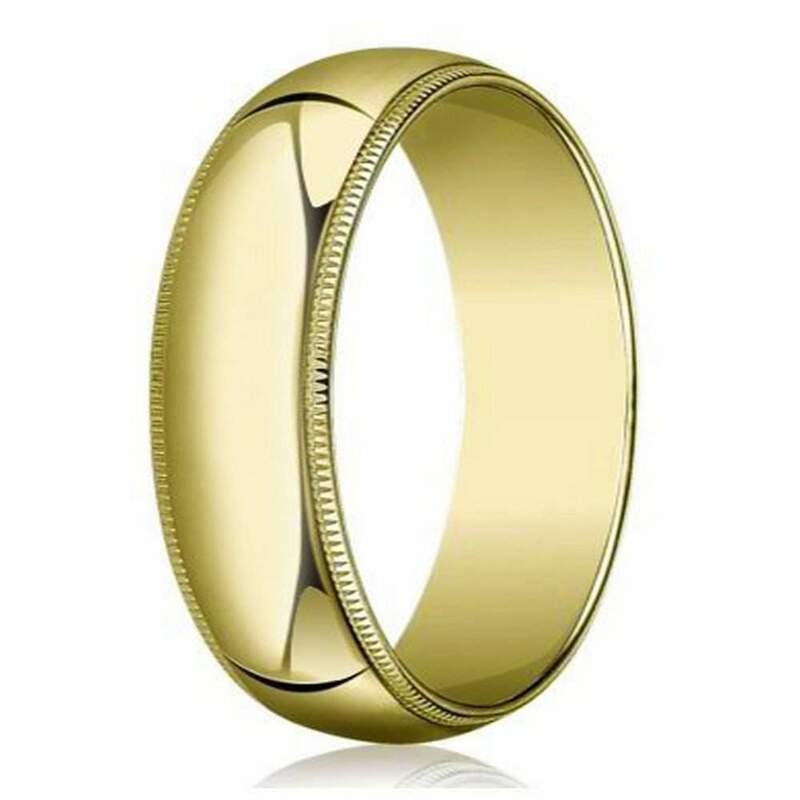 You can also customize the men's designer 6mm traditional fit milgrain 10K yellow gold wedding band by adding an engraving up to 30 characters in length. We treat every engraving with extraordinary care and attention to detail. Feel and look your absolute best on the big day and every day following by choosing a timeless ring with tremendous amounts of character. The designer 6mm traditional fit milgrain 10K yellow gold wedding band gleams as brightly as the sun and the classically domed profile has a distinguishing quality that will make you feel as unique as it looks. If you have a strict budget, 10K yellow gold may be the best option for you or your groom. 10K yellow gold may contain less pure gold by weight, but it is more durable than 14K or 18K yellow gold. If you have never been sized for a traditional wedding ring, we highly recommend that you visit a local jeweler to have your ring finger sized before finalizing your order. If you have any questions or concerns about the men's designer 6mm traditional fit milgrain 10K yellow gold wedding band, please contact us today to speak with an experienced jewelry representative.